If anyone was more qualified to write the definitive biography of Tubby Hayes, other than the late Ronnie Scott, then Spillett is that man. 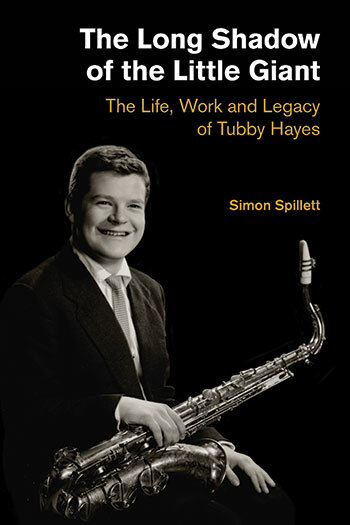 Spillett, born a year after Tubby died, may seem an unlikely person to write such a definitive tome on 'The Little Giant" but, having listened to Spillett's own playing, and digesting the time and research that he has put into the project no one could have done it better. If Paul Quinichette had had Simon's literary talents maybe he could have produced a similar work on Lester Young. Spillett covers just about every aspect of the tenorist's career from womb to tomb. Rightly recording Hayes' triumphs in America and at home - innumerable Melody Maker awards - the author also acknowledges the self destructive moments and the loves that always came second to the music. The book brings back so many memories - the Flamingo Club on Wardour St where I used to hang out during and after my National Service days when I lived in Edgware - the musicians, the characters. Tony Hall asking the audience if anyone had a Melody Maker so he could tell them who was on the following night! I'd follow the bands to the pub across the road during intermission, earwigging on conversations that weren't about Ddim7 or Aaug9 but "Yeah, I know her sister" or "What won the last race at Kempton?" or "Who's Arsenal playing Saturday?" etc. Musicians were human! All this and more is revealed in this the, surely, definitive work on a complex and dedicated musician. A giant living in a world that wasn't big enough for him. It's not a book to relax on the beach with, at circa 180,000 words - the equivalent number of notes in a Tubbs blast on Cherokee - the tide would have long come in and washed you away. It's true because you simply would not be able to put it down come hell or high water. That is, not if you belong to that generation that recognises Hayes as the UK's greatest ever jazzman. In Simon Spillett we have a very rare individual - able to evaluate the music at the highest level and also able to convey the day to day stuff, via just about every media reference known, to the reader without loss of pace. Again, like a Tubbs solo. PS: There's also an excellent discography. PPS: Marks out of a 100? 99 - 99? Whitley Bay isn't in Yorkshire! Perhaps it should read Whitby!! I agree - what a fantastic effort and a terrific read - I'm reading it a second time to get the full impact. All praise to Simon Spillett for an outstanding biography and history of the period.The acknowledgements reads like a who's who of all the jazz musicians of the period. Like you, it brought back many happy memories such as nights at the Flamingo, Ronnie's old and new clubs, attending many of the BBC Jazz Club recordings, Jazz 625, the Couriers' concert at the Dominion theatre and the 1958 Jazz Jamboree at the Gaumont State Kilburn which featured not only the Couriers but also the Vic Ash Sextet, the Johnny Dankworth and Ted Heath Orchestras, the Jazz Makers, the Tony Kinsey Quartet and the Chris Barber and Humphrey Lyttleton Bands amongst others.